What’s better than being on holiday? It’s living a holiday. Every day. no end to what you can experience. Megaworld Newport Property Holdings, Inc., handles pre-selling of residential condominium and hotel projects at Newport City. 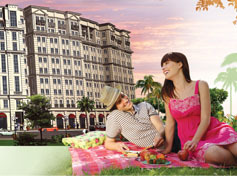 or visit the Newport City Grand Showroom and Model Units located inside Montecito Residential Resort, Newport City. The residential units provide a lot of leg room for individuals and families who want a taste of paradise. Each unit is carefully planned to balance solitude and keeping in touch with civilization. The model units show how a well thought out interior plan can maximize the amount of floor area. Located conveniently a few minutes away from the Makati Central Business District and far enough from the busy city streets of the metropolis, The Residential Resort at Newport City is the golden mean that sets the balance between city and resort living. Here, you're rewarded with resort luxury right in the comfort of your home. And all the pleasures you can imagine are within easy reach.